I didn’t think I was going to like Color Me Rad. I mean, I thought color runs were visually stunning. I loved the bold colors, the brilliant hues, and I would love nothing more than to be able to photograph the whole, beautiful thing. But actually being out in the melee? Three point one miles of running, while race volunteers threw colored powder at you, getting all over your clothes and skin? Of that, I was not sure. I don’t enjoy getting messy or dirty. I don’t love the idea of not getting a medal. And I wasn’t entirely sure how I felt about the concept of an untimed run. Y’all. I am so glad I did. It was so incredibly fun, I almost couldn’t believe it. It was organized and well-planned and every detail seemed in place. There was entertainment and great swag and so much more. 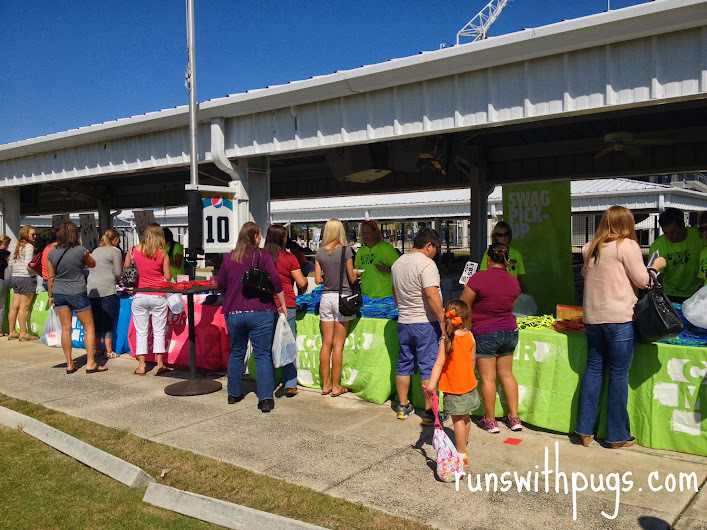 Color Me Rad Jacksonville took place at Everbank Field, home of the Jacksonville Jaguars. I was a little nervous because the course looked very similar to the one from the Daily’s Stadium Challenge a few months earlier. I was NOT looking forward to running all the ramps in the building, but I tried to make a positive of it. I haven’t been great with hill training lately, so it was a good opportunity for me to make up for lost time. Packet pickup was on Friday. I drove to the stadium around lunch time and found registration quickly. The staging area was incredible. Dance music pumped as I lined up to collect my bib, safety pins and RAD tattoo, and then moved to the next line to get my Color Me Rad t-shirt and neon sunglasses. Further down the table was more official merchandise. They had more tattoos, more colors of sunglasses, bandanas, shorts, tutus, knee socks and t-shirts and tanks for men, women and children. I picked up a bandana for my hair and a t-shirt for little man. It was a pretty great swag bag. I loved the official shirt, and it’s definitely going to get a lot of use. Also included was a “color bomb” which I could collect at the finish line for an incredible color mosh pit post-race. By the time I left pickup, I was feeling pretty pumped. I loved the energy and the great attitude of the people working the stations. I also got a flyer reminding me that if I brought two canned goods to the race for donation, I would receive an extra color bomb. Excellent. Saturday morning dawned and I was on the road by 7:00 AM, so that I could be at the stadium about an hour ahead of my wave’s start time (9 AM). My plan was to arrive, meet local bloggers JennErikHams, run at 9:00 and then change and zip home to catch the end of little man’s tball game. I packed a breakfast of a banana and Luna bar, some water and my race shirt and flip flops for after the run. I decided to leave my iPod at home, and very carefully wrapped my phone in saran-wrap before encasing it in a ziploc bag to keep it safe from the multi-colored, food-grade, gluten-free corn starch that would be repeatedly flung in my general direction. What I forgot? Gas for the car and deodorant. Oops. I stopped at the nearest gas station to fuel up, and was able to grab the necessary item from the sundries area of the attached shop. Excellent. Unfortunately, I had a little accident when I was about 10 minutes from my destination. It involved a hole in the road, an errant construction barrel and my passenger side mirror. No one else was around, and the mirror was the only thing damaged, but I was a little shaken and upset. I really hoped that running would help cheer me up and get my mind off the car, and I pulled into the parking lot, determined to have a great morning, regardless. The race area was ROCKING. As the sun rose over the stadium, I took in the sights and sounds. Music blared from speakers and an enthusiastic emcee hosted impromptu contests and dances from a central stage. Runners and walkers of all ages milled about, dancing, talking, and taking pictures at some of the step-and-repeats located near the start line. There were a lot of tutus, wigs and costumes, and I loved watching some of the cool and crazy outfits walking by. Despite the morning’s incident, I was feeling really relaxed and comfortable. No sign of my usual pre-run nerves. I was loving it. At around 8:30, I got a text from Jenn, of JennErikHams, and made my way over to meet her, her husband Erik, and another friend who was running with them. It was awesome meeting another local blogger, and we had a great time chatting. Since I was alone, I asked if I could run with them too, and they were kind enough to include me in their group. All clean in our pre-race whites. We were so busy chatting that I missed my 9:00 AM start, but it was ok. We just joined the queue of runners, and waited in the starting chute for another wave to start. Volunteers allowed a certain amount at a time to enter the course, but it wasn’t a long wait, and soon enough, we were off, crossing the start line in a cloud of lime green corn starch. The course wound through and around the parking lot of the stadium for a bit, looping back on itself a few times. We circled the stadium, did an out and back on a main road, and then finally, headed up the dreaded ramps (but only halfway), around the concourse, down, and then onto and around the field, before emerging to the finish line. All the while being pelted with glorious color. There were five stations: green, purple, pink, yellow and orange. And I’m pretty sure I was equally covered in all of them. I didn’t miss having my own music, because we were chatting amongst ourselves, enjoying the costumes and great race shirts that surrounded us, and mugging for Erik’s camera (he took the most amazing photos, which he was kind enough to share). Before I knew it, we were done. There was a bit of a backlog at the finisher’s shoot, with people collecting bottles of water, small protein bars and their color bombs. It took a few minutes to detangle ourselves from the crush, but finally, we were out and able to enjoy the post-race festivities. The emcee was still going strong, hosting more contests and every ten minutes or so, he would gather people in front of the stage for a color toss. They counted down and flung their open pouches of color dust in the air, creating the coolest visual display. We hung around for a bit, and then got in line for the pro finish photos. Our photographer was all about the fun poses. Race amenities were spot-on. Plenty of porta-potties, one well-manned water station (I skipped it because I wasn’t thirsty), two food trucks serving pre- and post-race (additional cost), ongoing entertainment, wonderful volunteers, awesome race photographers and great staff. Aside from the bottle neck at the finish, I can’t think of one thing I would change or improve. This is definitely a race to do with friends or in a group. I really don’t know if I would have had half as much fun on my own as I did on Saturday. 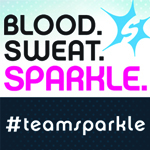 When I sign up for next year’s Color Me Rad, I’ll be sure to have an actual team to share in the good times. It’s a great family event and I loved seeing all the kids out there with their parents. Protect your electronics. My saran-wrap and baggie solution worked great for my phone. I was able to get some pictures without too much interference and I didn’t get any color on it. Erik’s camera had a protective casing on it to keep it safe. Wear old shoes and clothes you don’t mind ruining. Not owning a white running top, I scored one from a clearance sale, and paired it with black capris. Everything washed up fine, but I wouldn’t have been upset if it hadn’t. I had heard stories of the corn starch dust creating breathing difficulties. This was not the case for me, at all. I had a bandana that I used to protect my hair, that would also double to cover my mouth and nose if I experienced any trouble, but I was fine the entire time. The sunglasses are pretty crucial for protecting your eyes from the dust, especially if you wear contacts. The ones provided by the race worked great, but any will do. If you’re not a runner, don’t worry. We did run the majority of the course, but there were plenty of walkers, two people on crutches and one gentleman in a motorized wheelchair. There’s room for everyone. Enjoy and take lots of pics! The on- and off-course photographers were stellar (the best of any race I’ve done), so ham it up for them and for your own camera. You won’t be sorry! Huge thanks to Color Me Rad, the staff, the volunteers and new friends!. I can’t wait to do it again! 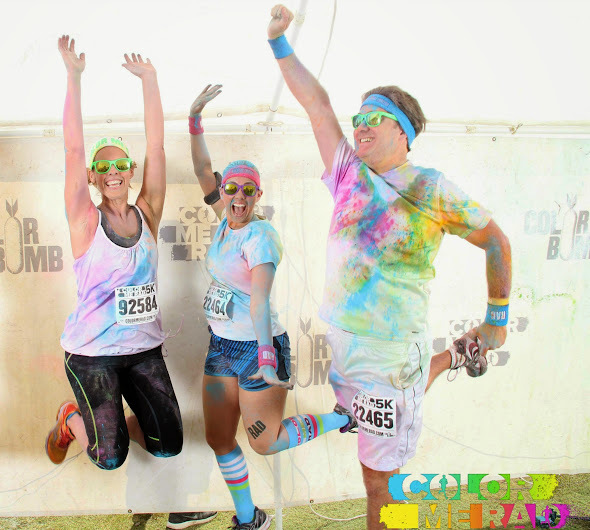 I have secretly always wanted to do one of these color runs, but agree with you that it would be much more fun with friends or a group. 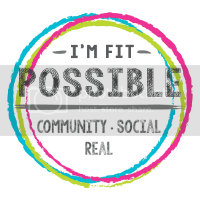 I may just have to break out of my shell and try a few new things next year, and get a group together and do a color run. Glad you had such a great time!!! You need to try this one. I could not believe how much fun I had. Every time I think about it, I just break out in a grin. So cheesy, I know, but seriously. I know you won’t regret it! Sounds awesome and I’m like you when it comes to getting dirty. You’ve convinced me so now I want to be apart of your group next year! Oh, grand! You got the memo that this was my diabolical plan! I expect you to be there, with tutu in tow! It’s going to be awesome! Why can’t all race photos be this good? Seriously. GREAT race photos! And, I love that they’re actually affordable. 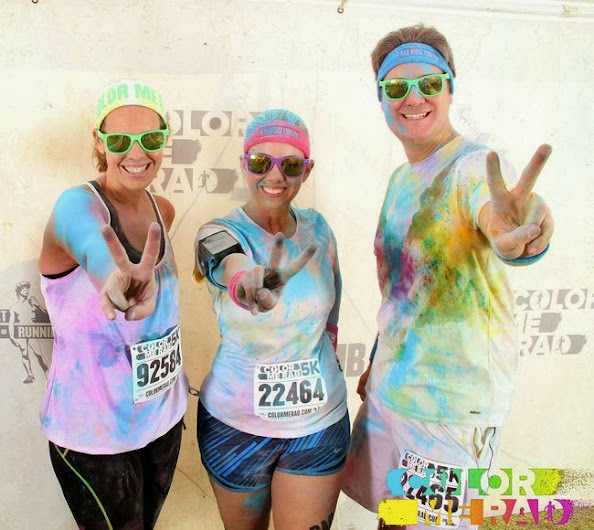 I was a little iffy on color runs, too, but you make it sound fun … if only just for the photos. Jina recently posted…If invited to Datz Dough, go! So affordable! They have the race logo in the bottom corner, but it’s not a big deal. Seriously. Such a great experience. This is really interesting. I love the idea as a great way to get people out and doing something fun and active but never thought I would do one myself. Your tip about doing a color run as a group though is great. I can see how this could be a lot of fun for me and my friends! I’ve already started rallying a group for next year. I already have a ton of ideas for outfits and ways to make it even more enjoyable. It’s a great vibe and even if you’re not timed or competing, it’s just good, not-so-clean fun. I would definitely give it a try. I am glad I did Color Me Rad when they came, but I won’t do it again. It took us two hours to get in for traffic and it wasn’t worth it for me. I am so glad your experience was better. Great recap!! I did Color Me Ra last year and had a blast with friends. I didn’t run the whole things because they walked some and I wanted to stay with them but I was definitely okay with it. I had a blast and at the time I needed that re-motivation for my running and it was the perfect thing. I have the Lifeproof case for my iPhone so I didn’t need anything for it, I just ran under water to wash it off when I got home. 😉 Glad you had a blast and these were awesome pics! I want a Lifeproof but I’m upgrading to a 5 sooner, rather than later and I don’t want to spend that much money just have to replace it in a couple of months. I definitely think it’s a great experience to go and walk/run with friends. It’s just such a cool atmosphere. What fun! =) Some friends and I did a Color Run last year. Totally fun, but one was enough for me. I think I’m getting too old/fuddy-duddy-ish. LOL But we did have a blast. =) Glad you enjoyed yourself! Your pics are awesome! LOL! And here I thought I was too fuddy-duddyish to enjoy it in the first place. Then again, I’ll do a lot of crazy things for good pictures!